Are you part of a MOPS group? Or have you been in the past? It stands for "Mothers of Preschoolers" and has been one of my favorite things that I've been a part of since becoming a mom. We meet every other week for breakfast (without kiddos! ), a speaker of some sort, and a craft. The "craft part" is what I'm responsible for. We typically make some sort of craft that can be made quickly and on the cheap - since we have over 50 moms in attendance! 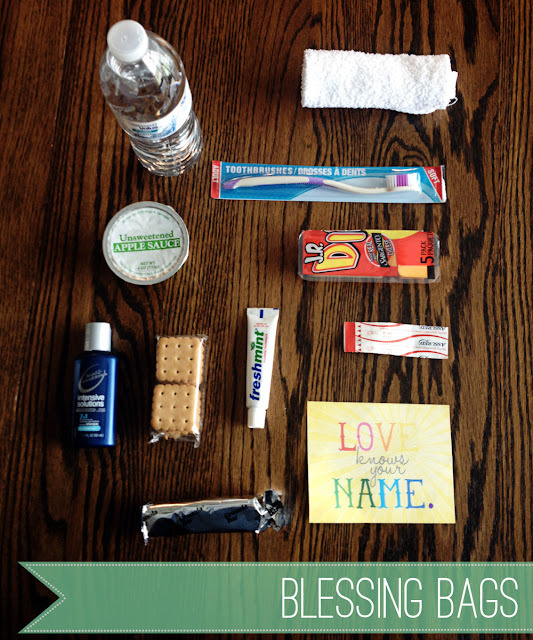 This past week we made Blessing Bags. 11. A sweet printable from Joy's Hope. I bought all of the supplies to make between 40 and 50 bags for a little over $90! We have also put these together with our college students and asked everyone to bring an item for the bags. Either way, it doesn't have to cost a lot of money...but it can make a big difference in someone's day! this is a wonderful idea, we need to let more people know that they are valued and people care.